Make a plan and be sure all family members know it well. Practice it a few times throughout the year. You may be seeking shelter in the middle of the night with no light to guide you so it’s important you know exactly where your pre-determined place of shelter is. Keep a weather radio in your bedroom so you know if a watch or warning has been issued during the night. Flying debris is the greatest danger with a tornado so keep protective coverings like thick blankets in your shelter space. Consider keeping bottled water and first-aid supplies in your shelter area, as well. A tornado watch is issued when conditions for tornado formation are favorable. It doesn't mean severe weather is imminent. A tornado warning means severe weather is imminent and is based on specific criteria and existing reports received by the National Weather Service. If a warning is issued, you should seek shelter immediately. Tune in your weather radio, or if possible, turn on your TV or radio. A strong, persistent rotation in the cloud base. Hail or heavy rain followed by either dead calm or a fast, intense wind shift. Sometimes you can’t see a tornado because of the heavy rain. A loud, continuous roar or rumble that doesn't fade like thunder does. At night you may see small, bright flashes at ground level. This could be power lines snapped by very strong wind or a tornado. In a house with a basement: Avoid windows and get to your shelter in the basement. If you can, crawl beneath a heavy piece of furniture or cover yourself with heavy blankets. Know where heavy objects sit on the floor above (pianos, refrigerators, large dressers etc.) and avoid sheltering under those areas. If the floor above weakens, they could fall through. In an apartment, dorm, or house with no basement: Avoid windows and go to the lowest floor, a small interior room like a bathroom or closet, under a stairwell, or an interior hallway with no windows. Crouch as low as you can, facing the floor, and cover your head with your hands. Cover yourself with heavy blankets. In a bathroom, the tub may provide more protection. In an office building: Follow your employer’s tornado drill instructions. Go directly to an enclosed, windowless area in the center of the building and on the lowest floor possible. Interior stairwells can be a good place to take shelter. If it’s not crowded, move to the lowest level quickly. Crouch down and cover your head. Stay away from elevators; if the power goes out, you could be trapped. At school: Listen to those in charge and follow the drill. Go to the interior hall or room in an orderly way. Crouch low, head down, and protect the back of your head with your arms. Stay away from windows and large open rooms like gyms and auditoriums. In a mobile home: Get out! Mobile homes aren’t safe. Go to a nearby shelter or permanent structure. Most tornadoes can destroy even tied-down mobile homes so don’t risk your life and your loved ones’ lives by trying to beat the odds. In a vehicle: There’s no safe option if you’re caught in vehicle during a tornado, but there are some things you can do to try to stay safe. If you can see that the tornado is far away, and traffic is light, you may be able to drive out of its path by moving at right angles to the tornado. 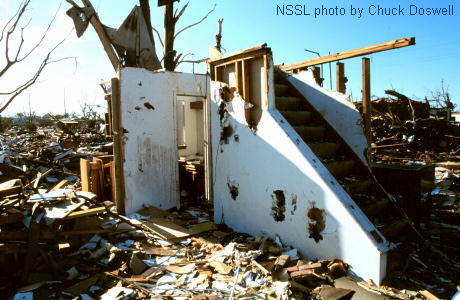 Seek shelter in a sturdy building or underground if possible. If you’re caught in high winds or flying debris, park the car as quickly and safely as possible out of traffic lanes. Stay in the car with the seat belt on. Put your head down below the windows and cover it with your hands and a blanket or coat. If you can safely get lower than the level of the roadway, for instance, to a ditch, leave your car and lie in that area, covering your head with your hands. Avoid seeking shelter under bridges. Outdoors: If possible, seek shelter in a sturdy building. If not, lie flat and face-down on low ground, protecting the back of your head with your arms. Get as far away from trees and cars as you can; they may be blown onto you in a tornado. Stay with others (your family, coworkers, fellow tenants) and wait for emergency personnel to arrive. Remain calm and alert, and listen for information and instructions from emergency crews or local officials. If necessary, try to provide aid to anyone who’s injured. Stay away from power lines and puddles with wires in them. Watch for broken glass, nails, and other sharp objects. Stay out of heavily damaged houses or buildings. Don’t use matches or lighters in case leaking natural gas pipes or fuel tanks are nearby.